Halloween 2010 - Which day to trick or treat? Which day to trick or treat? When are you celebrating Halloween? With Halloween falling on a Sunday I’ve been told some communities are scheduling trick-or-treating for Saturday instead of Sunday. Honestly I had not even considered the possibility that kids wouldn’t trick-or-treat on Halloween proper, Sunday, October 31. Now I’m wondering? In the past thirty years (I checked) Halloween has only fallen on a Sunday four times – in 2004, 1999, 1993, and 1982. Originally Halloween was for kids, but in the past few decades it seems to have become just as much of an adult celebration. As such, I can totally see someone throwing a party for adults on Saturday. But why would you move kids’ trick-or-treating from Halloween night (in this case Sunday) to the night before? Is it so they aren’t up as late on a “school night”? Given the likelihood there will be more adult parties and thus more drinking and driving on Saturday, might that make Sunday a safer night for kiddos out on the roads? And now for the interactive portion of this blog: Do you celebrate Halloween? 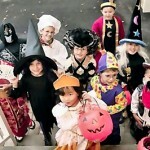 Is it all about the kids or do you dress up and/or go to Halloween parties, too? When is your neighborhood celebrating Halloween this year, Saturday or Sunday? Do you take your kids to a church party or perhaps a mall instead of going door to door like most of us did when we were kids? Happy Halloween! I have never considered trick-or-treating on a different night, would people even open their doors, would they be home? I don’t know how successful that would be. I would also feel weird, like maybe they thought we didn’t know when halloween was, that maybe we got the day wrong. That would be interesting to see how many people would try and correct us on the day!!! We live in the mountains, last year was our first year and it was lame. We have one neighborhood that you can walk door to door but this year we will be driving to the city. We might stop by a trunk-or-treat at a friends church and then go to a neighborhood. 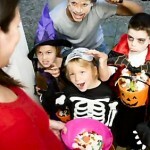 I have such wonderful memories of trick-or-treating as a kid and it’s fun to live it again through our kids! Hi Linsey. I see you got Erik to post a blog. That’s great. I left a comment. As for Halloween. I can understand grownups scheduling a party on Saturday, but trick-or-treating should be on Halloween proper. I’m sure I’ll rush to the store Sunday afternoon in a mad search for Halloween candy… as prepared as always. So anyone that shows up on Saturday will be out of luck. My wife was asking about trunk-or-treating. We’ll just be taking our wee one to a few of our neighbors and her toddler friends houses, and otherwise stay home. Hope you guys have a great one! Our kids are both grown and out of the nest and we live about 12 miles from the nearest town. Although we do dress the chickens up in costumes (last year, they were the Radio City Musical Hall Brawkettes,) and feed them candy corn on Halloween, I’ll have to think back to when my kids were small and what we did waaaay back in the olden days. Until my kids were old enough to understand the concept of Halloween (around the age of four or five,) we didn’t take them trick or treating. Not that there’s anything wrong with that. But Halloween, no matter what day it happened to fall on, that’s the day we took the kids out — at just after dusk, not in the daylight, which seems to be so popular now. No malls, no punkin patches, just plain old Halloween — which in my opinion, cannot be matched for childhood memories. Have fun with your kids next week — and don’t eat too much candy! Several of my friends live outside of town, and that probably does make it more of a challenge. We’re in a good-old-fashioned American suburban neighborhood. Well, I guess it’s old fashioned back to the 50’s anyway. And like many of you, I have great memories of trick-or-treating with my friends. We ranged far and wide collecting sugary goodness from neighbors, and neighbors of neighbors, and so on. The worst pranks we boys engaged in was “soaping windows”. And yep, we always did it on Halloween regardless of the day it fell on. I was surprised to hear some communities have scheduled there for Saturday this year. I hope you are kidding about the chickens??? Have a great Halloween! Haha! Yes, the chicken reference was a joke — we farmers try so hard to have a sense of humor. 🙂 My sister lives in Arizona and told me they have a large Mormon population who trick or treat on Saturday, leaving Sunday for worship I suppose. Anyway — you have a great Halloween as well! Yeah, if the image of trying to dress chickens in Halloween costumes hadn’t tipped me off, feeding them candy corn would have. Who knew farmers had a sense of humor. I come from a long line of North Dakota farmers, and aside from the occasional very unfunny cow tipping incidents, we are not known for our sense of humor. All righty now, back to work for me, dontcha know. We are most def going trick or treating on Sunday. I’m more into it for the kids since I have my own. Sometimes I will try and dress in theme with what my kid is dressing up as. Does that mean you dressed as Little Miss Muffet last year, Kristina? That would have been cute next to your little one’s spider. We’re definitely going on Sunday (as far as to peoples houses). Don’t know if there are other events on Saturday we might attend. Have a great Halloween. I agree with you and Linsey… I would not trick or treat on a different night other than on Halloween! It is the same as if it were Mon – Fri as far as school goes. We do have an adult Halloween Party every year and it will be on Sat. this year : ) I hope that you all have a happy and safe Halloween!! I love your blog and have recommended it to several friends!! Melissa, how very nice to meet you. I commented on your recent blog. I guess Halloween must be a special time since you met the hubby at his Halloween party years ago? So I understand why you continue that tradition. Thanks so much for recommending my blog. 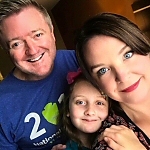 I’d love input on topics or whatever people would like to hear from a daddy’s perspective… or other ways I can make my humble little home on the web better. Have a ver safe and Happy Halloween! Just kidding. Why not double their sugary fun! I image some of the groups that are doing it on Saturday are church groups, e.g. the trunk-or-treat parties that my wife asked about. Have a safe and fun Halloween! Are you kidding? It’s the only reason why I buy them costumes and haul them around–More candy for me! 🙂 Stopping from the Mom Loop. Check out my post today. It may just make you laugh! Good point. Taking them out trick or treating on both Saturday and Sunday just means more candy for us to swipe. Oh, no… “Swiper, no swiping!” just popped into my head. If you don’t know what that means, you’re very lucky. Oh, I did read your blog. Very funny! Sometimes our town schedules fireworks on a day other than the 4th so that it will be on a weekend night… I have always found this annoying. I’m flexible about holidays… but there is no reason to trick or treat on a night other than Halloween. It is a kid thing so they shouldn’t be out that late anyway. 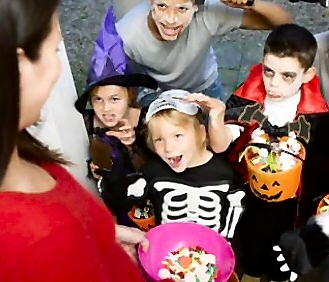 An adult party on Saturday… YES… but trick or treating on any other night is just plain confusing… I want to know when to expect trick or treaters so that I can have my house well lit… and have plenty of candy on hand. Our little town always does a thing downtown for the kids, where they just go to the small shops and police station and get stuff. They are doing it on Friday this year. I understand with them why they aren’t on Sundays because none of them are open on Sunday. I am not sure when they will be doing trick-or-treating here but since we are in the bible belt it will probably be on Saturday. Most people here are in church on Sunday evening. Plus I think they might be doing it on Sat because they don’t want them out late and sugared up on the night before school. Maddie already had a Halloween Party at the library today during Story Time and then we went to a friends church and they had a Fall Festival. She had a great time and got a lot of candy! Then, just because we are hobits and don’t want to do anything on the weekend but relax we are taking her to see her grandparents on Friday night. That’s about it for her on the trick-or-treating. She’d enjoy it now but I think maybe next year we will actually try to go out but usually no one is home! Guthrie does have that nice downtown area. Yes, I’ve been to Oklahoma. It makes sense to do a downtown Halloween event. No one really goes to downtown Dallas at night. Well, there are some interesting areas for adults to go, but def not a place for kiddos. So you’re in the bible belt? I thought we were the buckle of the bible belt down here in Texas? Anyway, you hobbits have a great weekend. I’ve lived in OK all my life and they have always said we are in the bible belt! That’s pretty much what we stand for. lol God, guns and America! Hey, Ann. I do wonder if kiddos may not try to do both Saturday and Sunday nights. I’m turning the lights off on Saturday. Bah humbug. No candy from us until the real “All Hallows Even”. For those who don’t know the origin of the name “Halloween” or more properly, “Hallowe’en”, it’s a reference to the evening before the Christian “All Hallows Day”, though most likely has it’s roots in much older pagan holidays. We’ll just eat some candy and ignore that bit. Have a safe and Happy Hallowe’en everyone when e’er you celebrate it. We do celebrate Halloween. My preschooler celebrated yesterday, and I brought her baby sister along. I dressed them both as bumble bees, lol! The local zoo is having “Boo at the Zoo” so thinking about taking them on Sunday pending the weather. Maybe religion has also played a part in not celebrating Halloween on Sundays? Not sure though. L. Elena, are you in the DFW area? That’s where we are. I ask only because the Zoo in Fort Worth is having it’s annual Boo at the Zoo, though I understand it’s during the day this year? I suppose other zoos probably do the same thing. Hope you all have a great time at the zoo and trick-or-treating! I just checked with Stac and she said Waxahachie is doing it on Sunday! As for here? I know there was a special Trick or Treating event yesterday evening in our wee down town for the Shops…(they aren’t open on Saturday or Sunday). I don’t know when it is officially taking place here. Yall have fun!!! Hi Mitzi. I’m sure ours is on Sunday. I can see towns with quaint downtown areas (my friend Nicole above is in Guthrie, OK) would have it on a night stores are open. No one in their right mind would trick-or-treat in downtown Dallas, though. Ah but you escaped from big city life (well you were south of Dallas so not that big)… anyway you don’t have do deal with that. But you will miss a very cool Pumpkin Village at the Arboretum on White Rock Lake… and “Boo at the Zoo” in Fort Worth. You guys have a great one! Sunday, definitely, Sunday. I’m taking the boy good ole traditional trick-or-treating. Halloween has always been my favorite holiday and I have such awesome memories of running yard to yard (except the time I was clothes-lined) to be the first to knock and the “trick-or-treat” shout out in stereo. Hi, Jill. I loved they way your described your memories of running yard to yard to be the first to knock and the “trick-or-treat” shout out in stereo. That’s just the way I remember it. We live in a nice neighborhood so it’s still possible for kiddos to do that here. I’m glad. Oh, and Sunday it is. Yeah, that would be confusing. No one came to our house last night, so I guess that means we’re celebrating on Sunday here. We’ll take little Molly to a couple of her toddler friends’ houses, and otherwise be home to dole out candy to the costumed kiddos that ring our bell. Have a Happy Halloween! I’ve wondered about that myself. I’ve found that many years, at least around here, Halloween trick or treating is done on a day OTHER than Halloween. What I want to know is, where is the committee that meets to decide this? (also, I want to know how to spell committee but am too lazy for spell check). Is there some kind of collective subconsciousness at work that tells everyone “MUST! Trick or Treat! On TUESDAY!”. Or something else. 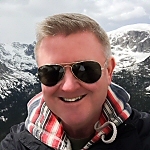 To answer your question……I have a Halloween birthday (well, today actually) so most years, I reject celebrating Halloween because I dislike sharing the spotlight. This year, I got talked into dressing up and going out on the town. First time in about 20 years. Yay. Hope you had a great birthday and night on the town. I think I’m going to either take my little girl to a big pumpkin patch (hay rides, jump houses and of course lots and lots of pumpkins) or to “Boo at the Zoo” at our local zoo. Have a great day! Absolutely. Why not do it both? Max out on all of the sugary goodness. That said, we don’t have four kids… I’m not sure I could handle that many all sugared up. Thanks so much for dropping by, brother. It’s nice to see other daddy bloggers out there. We had our annual Halloween party at my brother-in-law’s house on Saturday. It’s so great because the kids load up on sugar, play with the other kids, the adults have a blast and everyone (old and young) dresses up. We didn’t do trick or treating this year and the kids were totally okay with that. The one thing we do though is a little like Santa. On Halloween night (mostly to get the kids to go to bed!) Jack the Pumpkin King from Nightmare Before Christmas comes and brings them each a toy. Last year we did it in exchange for them leaving their candy for him and this year his “note” said that it was in exchange for them staying home and passing out candy. They’d rather have the toy over the candy anyway! Ha! Jack the Pumpkin King from Nightmare Before Christmas comes and brings them each a toy. That’s actually a pretty cool idea, Robin. And then you tailor it to fit whatever you want the kiddos to do, and leave a note from Jack Skellington? You’re a slightly twisted (well, more than slightly) genius. Glad you all had a good time at your brother-in-law’s party. Oh, and “thanks” for the award. Just once can I get an award with no strings attached? Bah humbug!